Is there a better alternative to WtLibrary? Is WtLibrary really the best app in Miscellaneous category? Will WtLibrary work good on macOS 10.13.4? WtLibrary needs a review. Be the first to review this app and get the discussion started! WtLibrary needs a rating. Be the first to rate this app and get the discussion started! 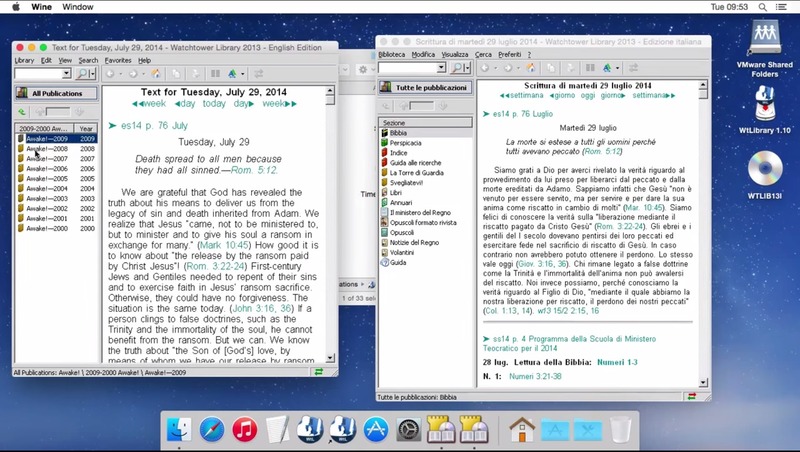 WtLibrary is not a substitute for the official Watchtower Library. Rather, it allows you to install and use the CD on Apple Macintosh systems. To complete the installation it is necessary to have your original disc (or a personal backup copy). If you do not have a CD player (e.g., MacBook Air), from another computer with a CD player, copy the CD contents to a USB memory stick, and then proceed with the classic installation using the thumb-drive. This application does not work with mobile devices such as the iPhone and iPad. The official Jehovah's Witnesses Website is www.jw.org. To proceed with the installation, follow the video tutorial.